We see those rosy cheeks, Anna Faris! When asked if Anna could see herself making a date night out of watching Overboard with Michael, the actress says "Hey! hey! hey!" and covers her cheeks with her hands. "I'm totally blushing!" she squeals before Derbez swoops into save the day. "I don't know," he teased, "for some reason she looks better than me in the movie. I don't know why! She looks beautiful." Anna also shared an adorable update on her 5-year-old son Jack Pratt, and why she thinks he's getting to the age where he's too cool for mom! "I think I always embarrass my son… Six months ago we would do this little game where I would say, ‘I love you to the moon and back' and he would say ‘I love you to Jupiter and back' and I would say ‘I love you to Uranus and back!'" Faris explained. She continued, "Recently he's stopped doing that. I found myself doing that in public to him and I could tell that he was getting embarrassed. He's like, ‘Mom, chill!'" Aww! Check out more from Anna and Eugenio in the video above. 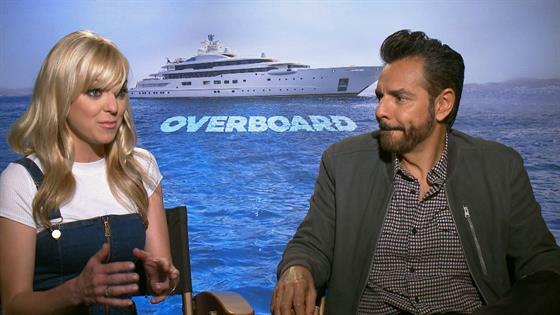 Catch Overboard when it hits theaters May 4.